Click the picture to download the Clyde walkway leaflet for Bothwell. Aside from my family, there are three things in my life that I feel extremely passionate about, photography, walking and history. Any one of the three can cause me to lose hours from my day. Regardless of the weather there is nothing I enjoy more than to be out wandering around the countryside. Generally before any adventuring, you’ll find me pouring over old maps and looking for historical information about the area that I plan to visit. I love finding relics from the past, old ruins, abandoned buildings, monuments, graveyards, that sort of thing. These all make for fantastic subject matter in my photographs and that allows me to combine all my favourite pastimes into one trip out. However like most people these days I am time poor. I like to think I’m a family person and always put their needs first (my family may disagree!) but then I find that my hobbies take a back seat. Between work, a wife and 3 children I struggle, struggle to find both motivation and the time to squeeze in much else. However since February this year I’ve been making an effort to get out at least one day a week even if it’s only for a couple of hours. When I’m out it’s mainly been for a walk, anything from a few miles to as much as 8 depending on where I go and how much time I have. Believe it or not I don’t normally take my camera with me, mainly due to time constraints, however I always have my phone. View of Carnwath Church and St Mary’s Aisle. Inside St Mary’s Aisle, Carnwath. 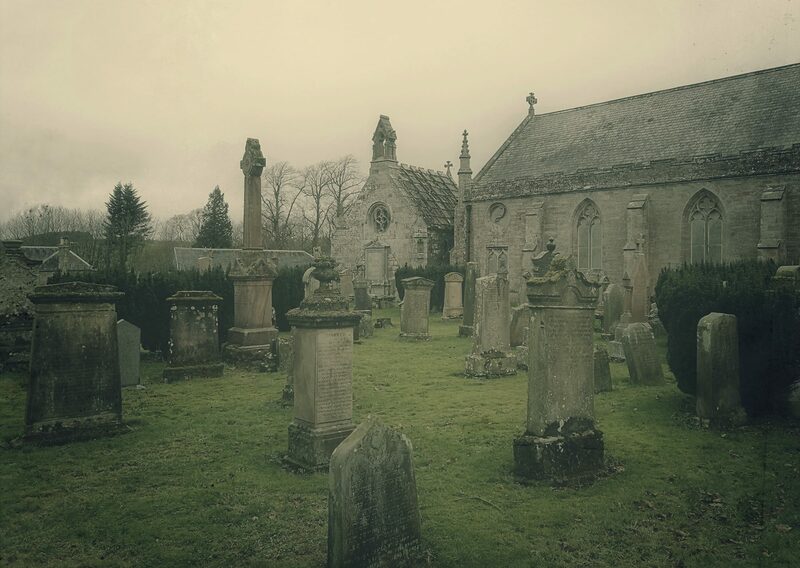 On most of my jaunts my focus is walking, generally it’s around some old historic estate trying to find any remains. I may not have my camera but I always try to take some photos on my phone. Not only does this provide me with a record for the future, it allows me to share what I have found with others online. My photography has definitely taken a back seat over this last 6 months. It’s not that I’ve given up on it or lost interest, it’s just I don’t have time to spend on it along with everything else, and walking has definitely been my priority. I am hoping now the mornings and the nights are lighter that I can fit in some proper photography between now and September but only time will tell. Inside the summer house at Dumfries House Estate. As I previously mentioned in another post, it amazes me how good mobile phone cameras have become. Some of the photographs I have taken whilst walking have turned out really good and I find now that I am enjoying using my phone more and more for photography. My phone is the Huawei P9, it has a dual lens camera co-engineered with Leica with one dedicated lens for monochrome. The results are fantastic, the quality is way above any previous phone I’ve owned or used, it allows manual control and shoots in DNG RAW format. As I said, I’ve had this with me on my travels and I’ve taken pictures on each trip. What your seeing on this page is some of my favourite pictures over the last few months, all taken on my phone and edited from RAW using Snapseed. We nearly all have a phone and it’s generally never far from us, I’d encourage you all to think about what you like and start taking some pictures, you don’t need the biggest or best camera to make a good photo. Previous PostPrevious The wider view.